An arrest on misdemeanor domestic battery charges will have serious, wide-ranging consequences for the mayor of Royal Palm Beach, Florida. The Miami Herald reported on November 14, 2017 that a protective order was entered by the judge overseeing the case, directing the man from having no contact with the victim. While the victim was not identified, Florida law defines the offense of domestic violence battery as the striking of a domestic partner, or family or household member. A conviction may lead to jail time, fines, and probation, but there are additional implications for the accused. State and federal law on firearms in the context of domestic violence charges will impact his legal rights in a number of ways. Florida has not enacted legislation prohibiting a person from buying or possessing guns after a conviction on a domestic abuse misdemeanor. However, there is a law requiring officials to review the records of a convicted person where federal law bans the purchase of firearms. If the individual cannot pass a background check under federal law, he or she cannot buy a gun. The ban on possession or purchase extends for three years after the individual serves a jail sentence for a conviction or completes the terms of probation. 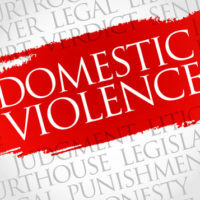 The subject of a domestic violence protective order is prohibited from buying or possessing guns while the order remains in effect. This mandate is intended to be consistent with federal law, which provides for a ban for abusers under a protective order. Florida law does require any protective order to include language stating that it’s unlawful for the respondent to possess firearms or ammunition. When a court issues a protective order in a domestic violence situation, a judge may direct the respondent to surrender firearms as part of the conditions of the order. Therefore, it would be a violation of law to refuse to turn guns over to police under such circumstances. Note that a judge isn’t required to include this type of provision in a protective order, so the issue is discretionary. In addition, it’s important to understand that Florida does not allow law enforcement to forcibly remove firearms – even when a protective order directs surrender. There is no law authorizing or requiring the removal of guns at the scene of a domestic violence call. Convictions and protective orders in domestic violence cases have serious implications beyond incarceration and fines. There are additional consequences that affect your right to possess and purchase firearms – plus, you’ll have a permanent criminal record and be forced to comply with Florida laws on registration as a sexual predator or offender. Considering these penalties, it’s critical to retain an experienced criminal defense attorney who is knowledgeable in domestic violence laws. If you’re facing charges related to domestic abuse, please contact the office of attorney Kevin J. Kulik in Fort Lauderdale. Our legal team can schedule a confidential consultation to discuss your defense options.